So I know insta-love is something that's been talked about to no end with some people loving it and others hating it. I decided that it was time to give my opinion on it. So if you don't know what insta-love is, it's pretty much exactly what it sounds like. Two people meet eyes across a room and they're instantly in love. I mean who hasn't heard of a love story like this. But I'm afraid for me it just isn't believable. Call me a cynic but I believe you actually have to know a person before you love them. Sure you could be attracted to someone and even maybe have a crush on them but LOVE is a completely different thing. The thing that bothers me the most about insta-love is that there's this whole 'we were fated to be together' crap. Which ya'no if you believe in fate and all that then that's totally your opinion but I don't. I believe we make our own choices and fate has nothing to do with the outcome. SO SO SO many YA books fall into the insta-love trap and it's so annoying for me. If a book has insta-love in it but it isn't the main story line (i.e. it's a fantasy book with underlying insta-love) then I can power through and handle it, but if it's a romance book that has insta-love then I'm out. It's just not realistic for me, it makes me feel like the characters have just been thrown together, there's no real connection there. Anyway, I know this was just a rambled post but I think it's a topic that a lot of people have an opinion on, some people actually really love it, but it's just not for me. Thanks for reading, let me know your thoughts on insta-love? 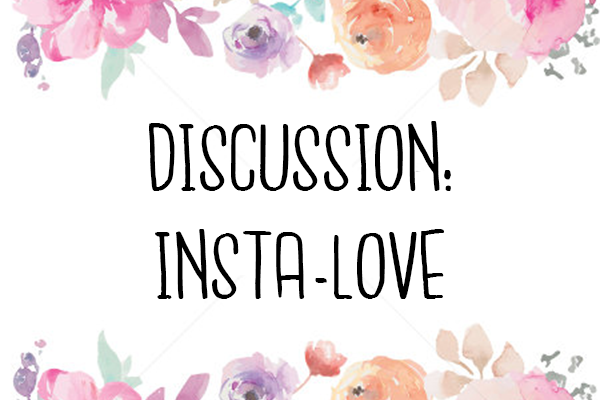 Have you read any books that have insta-love in but you still love? I totally agree with you! In fantasy stories authors can kind of get away with it, because who's to say that isn't how people fall in love in these realms. But it's just not very believable, in any case. Sure, you can be attracted to someone when you first meet, but that's not love. It's particularly hard in YA, because it sets up this unrealistic expectation of what love is like among younger people. I've read a couple books lately that had insta-love, but they weren't YA. In one book, the insta-love had no basis in anything, the two characters had just met, barely spoken two words to each other, and were ready to leave their partners to be with each other. In the other, the characters meet, fall in love, and are married within 5 months. Some might say that's insta-love, but at least these two spent a lot of time together and really got to know each other. Yes, I'm glad I'm not the only one who feels like this!